The Montan University of Leoben in Austria has awarded an honorary doctorate to Professor Georg Menges, the former head of the Institute of Plastics Processing (IKV). The Montan University of Leoben in Austria has awarded an honorary doctorate to Professor Georg Menges, the former head of the Institute of Plastics Processing (IKV) in Industry and the Skilled Crafts at RWTH Aachen University. On account of his globally acknowledged scientific achievements and the good relations existing between the Montan University and IKV since the late sixties, Prof. em. Dr.-Ing. 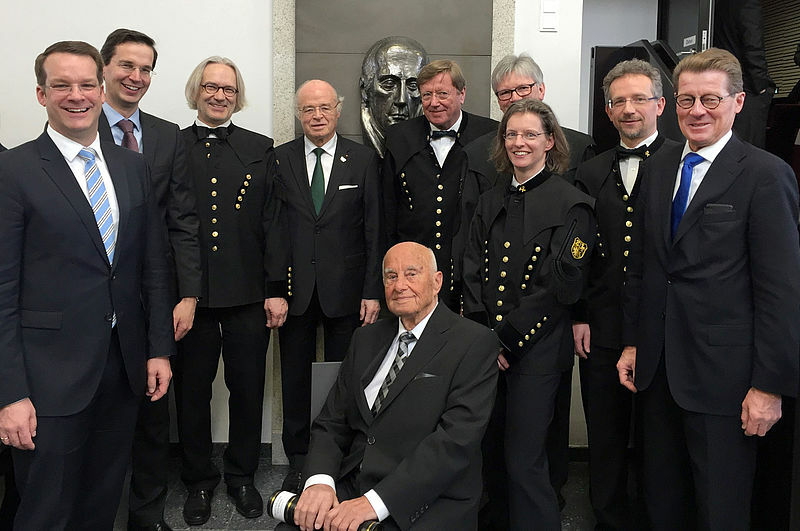 Georg Menges received the honorary doctorate during an academic ceremony on March 18, 2016 in Leoben. Because of its technical orientation, the Montanuniversität has traditionally always had close contacts with industry, extending to research and development partnerships over a period of many years. Alongside teaching and research, knowledge transfer has always been one of the three key drivers at Montan University. During his work at IKV, Prof. Menges made an important contribution to this. Prof. Menges, who is regarded by experts in the field of plastics technology as one of the major European pioneers of plastics processing, forged his links to the Montanuniversität Leoben back in 1968. Alongside the Austrian expatriate Prof. Herman F. Mark – the founder of North American polymer sciences – Prof. Georg Menges was the second high-ranking international advisor to the professorial council of the then "Montanistic University of Leoben" on the preparation and setting-up of the plastics technology study course in 1968/69. Prof.Menges promoted the new plastics technology course in Leoben in a variety of ways, not only during the setting-up phase, but also by encouraging a lively exchange of know-how via guest speakers and conferences. In 1994, in the publication to celebrate the 25th anniversary of the plastics technology course, Prof. Menges wrote: "The good work you have done is very visible in the students who have completed the course. Measured in these terms, the course of study is top class. I am proud to have been involved in the initial concepts to set up this field of study. May I combine my warm thanks for the many years of friendly cooperation with my very best wishes for the future of the plastics technology course." The Plastics Technology department in Leoben has since grown to embrace six Chairs and, together with the closely linked Polymer Competence Center Leoben, now carries out plastics research with more than 200 staff. Inspired by the know-how exchange initiated by Prof. Menges, the cooperation was expanded in the field of plastics injection moulding under the IKV leadership of Prof. Dr.-Ing. Dr.-Ing. E.h. Walter Michaeli to form a continuous research cooperation as part of several EU research projects. Over and above this, under the present head of IKV, Prof. Dr.-Ing Christian Hopmann, several applications have been filed jointly for EU projects on plastics processing, and a lively exchange of know-how has been encouraged in the field of elastomer injection moulding. Joint national and European projects are to be further developed from this. As part of this, IKV will join the Polymer Competence Center Leoben as a scientific partner.